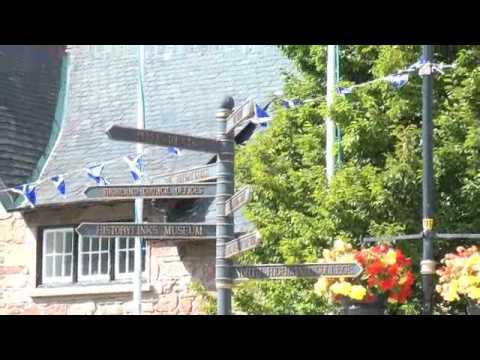 Dornoch (/ˈdɔːrnɒx/; Scottish Gaelic: Dòrnach pronounced [ˈt̪ɔːrˠn̪ˠəx]; Scots: Dornach) is a town and seaside resort, and former Royal burgh in the Highlands of Scotland. 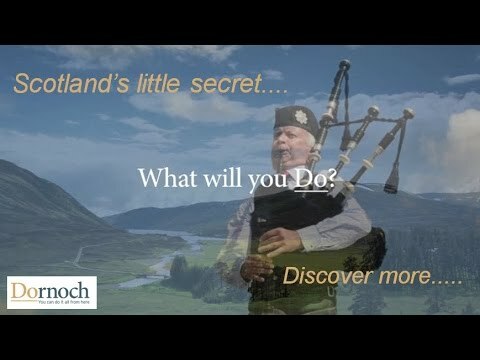 It lies on the north shore of the Dornoch Firth, near to where it opens into the Moray Firth to the east. 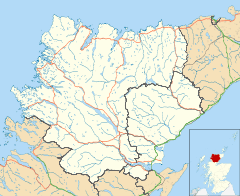 The town is within the Highland local government council area, and within the county of Sutherland. The town is near the A9 road, to which it is linked by the A949 and the B9168. The town also has a grass air strip suitable for small aircraft and helicopters. The name 'Dornoch' is derived from the Gaelic for 'pebbly place', suggesting that the area contained pebbles the size of a fist (dorn) which could therefore be used as weapons. Dornoch has the thirteenth-century Dornoch Cathedral, the Old Town Jail, and the previous Bishop's Palace which is now the well-known hotel, Dornoch Castle and a notable golf course, the Royal Dornoch Golf Club, named the 5th best golf course outside the United States in 2005 by Golf Digest magazine. It is also notable as the last place a witch was burnt in Scotland. Her name was Janet Horne; she was tried and condemned to death in 1727. There is a stone, the Witch's Stone, commemorating her death, inscribed with the year 1722. Legendary golf course designer Donald Ross began his career as a greenkeeper on the Royal Dornoch links. The golf course is next to the award winning blue flag beach. Dornoch in Sutherland was a royal burgh that returned one commissioner to the Parliament of Scotland and to the Convention of Estates. After the Acts of Union 1707, Dornoch, Dingwall, Kirkwall, Tain and Wick formed the Tain district of burghs, returning one member between them to the House of Commons of Great Britain.